The Asus R407UA-BV054T is a new 14-inch notebook designed for productive office productivity , priced at less than 600 euros . Housed in a sleek silver design shell, it is based on a Core i3 Skylake, a large amount of RAM (8 GB) and a precious SSD dedicated 256 GB, enough to provide a welcome reactivity to Windows. You will also find a rather light weight and a backlit keyboard. The Asus R407UA-BV054T does not revolutionize PC design codes with its silver gray tones and rounded lines. However, the result is neat with a dark brushed effect on the lid and two textures on the inside: squared on the space where the palms rest and dotted around the keyboard. It is discreet but it has the merit of getting out of the ordinary smooth and dull. Side measurements, it is positioned in the average with a relative fineness of 21 mm and a reasonable weight around 1.5 kg , enough to open a little nomadic life. Also noteworthy is the addition of a keyboard backlight system that will highlight the keys for easier typing in dark environments. Most valuable element in the configuration of the PC, the dedicated SSD will work primarily to provide responsiveness and liveliness to Windows 10. It generates a significant gain in terms of silence, energy saving and reliability compared to a hard drive traditional. Nevertheless, its storage capacity of 256 GB can decently not be measured against the latter and does not allow to archive an important toy library. The use of an external storage system and / or online becomes essential. 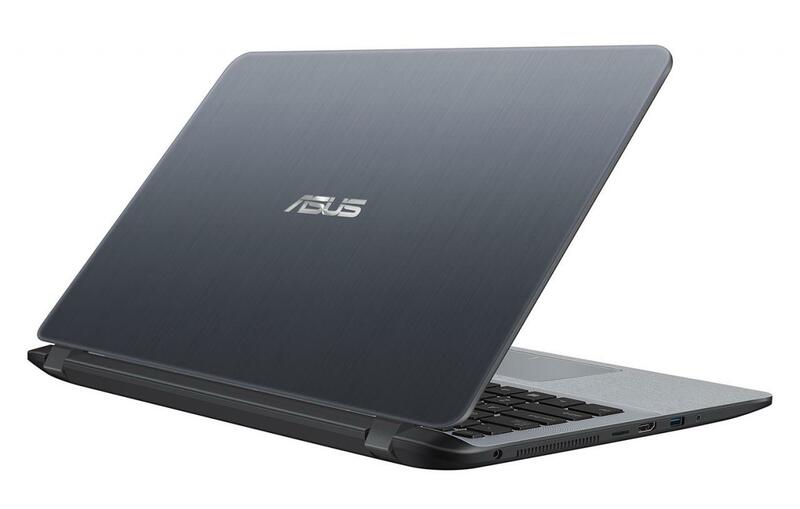 The Asus R407UA-BV054T is equipped for office use with a base installed on a Core i3 Skyakeand 8 GB of RAM . Internet browsing, working on Office or video playback are perfectly managed by this duo as well as light photo editing. But it will not be able to tackle more demanding in terms of applications. Good point, the RAM presents in quantity will offer a nice amplitude in multitasking , enough to satisfy the collectors of tabs on the browser. On the screen side, the finding is a bit disappointing compared to the price charged. The definition is standard (1366 x 768 pixels) and the support of a TN panel offers narrow viewing angles and a medium colorimetry. The glossy slab is acclaimed by some who find it more aesthetic but others may be embarrassed to use with the reflections it brings to the screen. Let\’s finish with the connectivity that is at least frugal. The sides of the PC only have one HDMI output, two USB ports including a USB 3.0, a headphone jack and a micro-SD card reader. Exit the Ethernet port or USB Type-C. Similarly, the wireless modules are older generation Wifi 802.11 N and Bluetooth 4.0.